Breakthrough Developmental Services is seeking a qualified Occupational Therapist to help us make a difference in the lives of our clients. To be considered for this position, the candidate must be licensed to practice in Maryland and have experience working with pediatric clients. Preferred candidates will have a minimum of 1-year experience providing services to people with developmental disabilities and their families. Qualifications:To be considered for this position, the candidate must be a licensure verified by Maryland Board of Occupational Therapy. Knowledge, Skill and Abilities: In your resume and cover letter, you should address your experience and training working with people diagnosed with special needs. Specifically, discuss any professional experience working with people who have developmental disabilities and any training that you have received. The materials that you submit with your application will not be returned. Any person hired for this position must complete all BDS trainings before beginning with a client. Satisfactory reference, state and FBI backgrounds checks are necessary for this position. 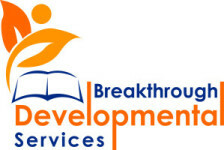 At Breakthrough Developmental Services, LLC (BDS) we work with parents, organizations, and individuals who want to help their students become successful and more independent. We are a caring group of individuals working together to make a difference in the lives of the people around us. At BDS, we use the principles of applied behavior analysis and verbal behavior to teach skills in both the structured and natural environments while making learning fun and interesting. Each program we write is tailored to meet the needs of the individual, or family, we are serving. BDS is a Maryland Autism Waiver Provider.